Villa Kibele overlooks the sea on the exclusive Cukurbag Peninsula, close to the historic town of Kas. 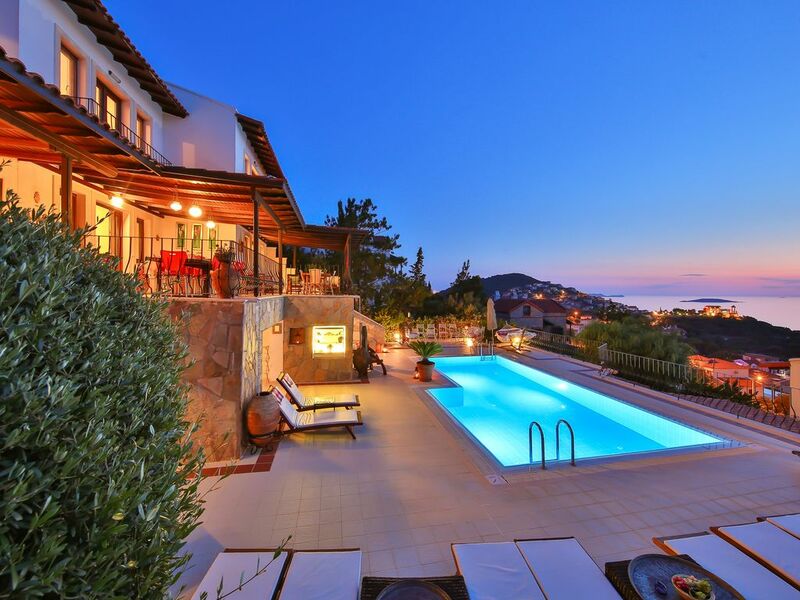 Villa is located at the best area both view and location. Designed and built by its' architect owners - no attention to detail has been spared both internally and externally. The villa is completely surrounded by beautiful gardens (bouganvillea, jasmin, lemon, banana, olive and orange trees to name but a few) which are enclosed within stone walls giving both security and privacy. The villa offers a large private pool/terrace along with numerous sun bathing areas within the gardens. The owners have created the villa which offers a unique insight into Turkish culture and many of the furnishings and art are representative of this. All in all Villa Kibele is the perfect place for a special family occasion/holiday or for groups of friends wishing to experience a luxurious and relaxing holiday. The villa can accommodate a maximum of 24 people but smaller groups/families are welcome. Minimum stay 3 nights. Villa Kibele has fireplaces and central heating system so ideal for autumn and winter. * Private catering service is available for breakfast. * BBQ service is available. * Baby-sitting service is available. * Fresh bread is delivered daily to the villa. * Drinking water is delivered to the villa. * Massage service is available at the villa. Transfers & Local Arrival: Private transfers (from the airport & to the airport) can be arranged with air-conditioned minibuses or car on request at cost.Dalaman Airport is approximately 2.5 hours drive and Antalya Airport is about 3 hours from the villa. The Cukurbag peninsula is west of Kas and is surrounded by olive and almond trees. Villa Kibele is situated on the lagoon side of the peninsula and is only 3 kilometers from the town of Kas.The friendly town of Kas is only five minutes by car.There are plenty of taxis available in Kas. Minibuses pass at every half an hour in front of the villa.Cultural sites are within easy driving distance.There are lots of agents which organizes cultural trips. Staff : Staff carries baggages in your bedroom and he is on call for your needs. Staff maintains the garden, terraces, swimming pool, collects refuse and makes daily light cleaning of the villa. Maid service is provided once a week for cleaning and the change of towels and linens. Additional cleaning is available at local charge. * Hot water is available 24 hours. * All bathrooms are furnished to a very high standard. * All bathrooms have hair dryers and shaver sockets. * All bathrooms have stainless steel towel racks,shower cabins,white porcelain WC with bidets & sinks. * Laundry baskets are provided. * Cotton bathroom towels are provided. * Bathroom products (toilet papers, soap) are provided. * Crockery and complete kitchen utensils with saucepans and pans for 19 people are available. * Kitchen has 4 ring stove & hob,toaster,fridge with freezer,water dispenser, dish washer,kettle,filter coffee machine,grill,microwave & oven,freezer. * Breakfast service for an additional fee. * Water and bread service for an additional fee. •Check-out time: 11:00 am, Check-in time: 5:00 pm •Only guests whose names appear on the Registration Form are allowed to stay overnight at the villa. The number of additional guests should be notified to us and the payment for additional guests have to made before entry to the villa. •Under no circumstances should the numbers notified to us in advance be exceeded and overnight guests are not accepted. •Daily visitors for swimming in the pool are not accepted. •Smoking is not allowed indoors. •Villa will be rented complete with the proper fixture, fittings, and furniture and safety boxes in each bedroom. It is your responsibility to keep your valuable goods such as camera, laptop, jewelry and money. We are not responsible for any damage or loss of them. This is our reserved right according to the law. •Pets are not accepted. •Pool is not allowed after 22:00 pm. since automatic treating system begins. Outstanding stay with 20 friends! We were so well looked after - couldn’t recommend this place more! We had a quite large party of 13 adults and 7 kids, all arriving at various times and asking lots of questions in advance and Güler always responded very promptly. She also helped us organise a boat trip in advance - which was very reasonably priced and an absolute highlight of the holiday. The villa itself housed us all very well and we didn’t want for anything with fresh bread and water deliver everyday and her team on hand should we have needed anything. I also asked Güler if we could pay her to make a cake for a birthday which fell during our stay (as we’d heard about her cake making expertise from the other reviews). She made us a stunning chocolate cake, beautifully decorated and left some fireworks to go with it! And wouldn’t accept any money for it, saying she’d like us to have it as a gift from her. Needless to say we’ve recommended this place to everyone who has asked. Book your holiday here. Jako, że byliśmy pierwszymi gośćmi z Polski, więc piszę po polsku. Może to zachęci naszych rodaków. Bardzo ładnie położony, w pełni wyposażony obiekt. Byliśmy grupą 17 osób, dorośli i młodzież i każdy miał wystarczającą przestrzeń dla siebie. Obiekt jest bardzo dobrze rozplanowany, czysty. Wyposażenie dobrej jakości i w wystarczającej ilości. Basen całkiem duży i bardzo dobrze utrzymany. Właścicielka i jej pomocnik bardzo mili i pomocni. Pomogli nam zorganizować transfer z lotniska oraz kilka wycieczek. Szczególnie polecam całodniową wycieczkę łodzią po okolicznych plażach i wyspach. Spędziliśmy to bardzo fajne wakacje. My family of 14 have been to Turkey 6 times now, this was our 1st visit to Kas. We were a large group - 8 adults, 9 children - but the house is so well designed that we all had enough space. Pool is wonderful, and the area around the pool was bliss - lots of space to lounge around. Setting is wonderful. The hosts really made our stay very special - cake when we arrived, large fresh fruit platter, bottle of wine; more beautiful cakes later on in the week. Daily light cleaning was very helpful, and the agent was also super helpful. All in all, we had a wonderful stay, helped hugely by Guler and her team. Guler helped us arrange car hire, transfers, restaurants etc. All the rooms are comfortable and well appointed. All with en suite bathrooms. Everything was spotless and in excellent condition. Any minor snagging issues were dealt with promptly. Well equipped kitchen. Lots of fridges and freezers (essential) plus washing machine and two dryers. Lovely balcony space with plenty of room for us all to eat outside. Thoroughly recommended. We were a family of 22 adults and 3 toddlers and each one of us loved the villa. There was enough space for all of us. The rooms, the quality of furnishing, the location and everything else was as excellent. Guler was extremely good at communicating everything and very helpful and prompt at responding to emails and phone calls. I think it is one of those few places where the pictures can't do full justice to the property it self. Oh and the cake Guler bakes are just outright delicious. My mom wanted to get the recipe from her so I will have to write to her separately about that :). Highly recommended for large or small groups, you can't go wrong with villa kibele!! This villa was perfect for the 9 guests that were part of my party. It was clean, spacious and had amazing views. The owner greeted us and had baked a cake but the main star of the holiday was Ercan - he was there to help with anything we needed. He helped arrange trips, taxis, lunchtime food deliveries and even evening meals out in Kas. Wonderful week in a beautiful villa and town! Kas is located 200 kilometers west of Antalya and was founded in the 4th century BC as the site of the ancient Greek town of Antiphellos. It is located between the Mediterranean and the Taurus mountains. This region known as Lycia is the homeland of the Lycian civilisation. Now only rocks and tombs, sarcophagi and the amphitheatre are left but the charm of the town remains. It is a pleasurable experience to wander through the streets, stopping to examine the tourism shops that offer Turkish handicrafts, leather goods, copper and silver items, cotton clothing and the inevitable hand made carpets. Kas has a population of around 8,000 people and is a highly desirable location to spend your vacation. It has a wide variety of restaurants and cafes to choose from at very reasonable prices. There is an active night life if that is your want, but should you choose more cultural activities, the ancient sites of Myra, Demre and the Xantos valley are within easy driving distance. Booking Procedures: * We accept payment by bank transfer in GBP, EUR, USD. * The onus is on the client to pay all bank transfer charges. * Late bookings considered. *Check-out time is 11 am.This can be flexible depending on the arrival time of incoming guests. * Rate includes daily maid service for light cleaning of the villa and daily pool and garden maintenance. * Rate includes bathroom products (toilet papers, soap,laundry soap). * Rate includes kitchen products (detergents,sponge, dish towels) * Airport transfers and car rentals can be organized. * Booking possible breakfast on request at an extra cost. * Booking possible massage service on request at an extra cost. * The villa is an enclosed walled area, very secure and private. * There will be no other tenants during your stay.